Malaysia and delicious food go hand-in-hand. In 2015, a global survey conducted by CNN placed our beloved country on the sixth spot of their World’s Best Food Destination list. That wasn’t an isolated recognition either. There have been countless other international experts, critics, and food lovers who have expressed their love towards the Malaysian food experience. But of course, we don’t need anyone to tell us about the abundance of good food spots in our country. The average Malaysian opts to dine out on a regular basis. With customers being spoilt for choice, eatery spots need to provide something extra beyond a good menu. Here are 5 restaurants in Malaysia which offer you a truly unique dining experience. Have you ever wondered how it would feel like being an Eskimo living in an igloo? Or perhaps you have young kids or siblings who adore the magical powers of Princess Elsa from the movie Frozen? Now you can come close to replicating those experiences by going to Ice Café, which is located in Georgetown, Pulau Pinang. 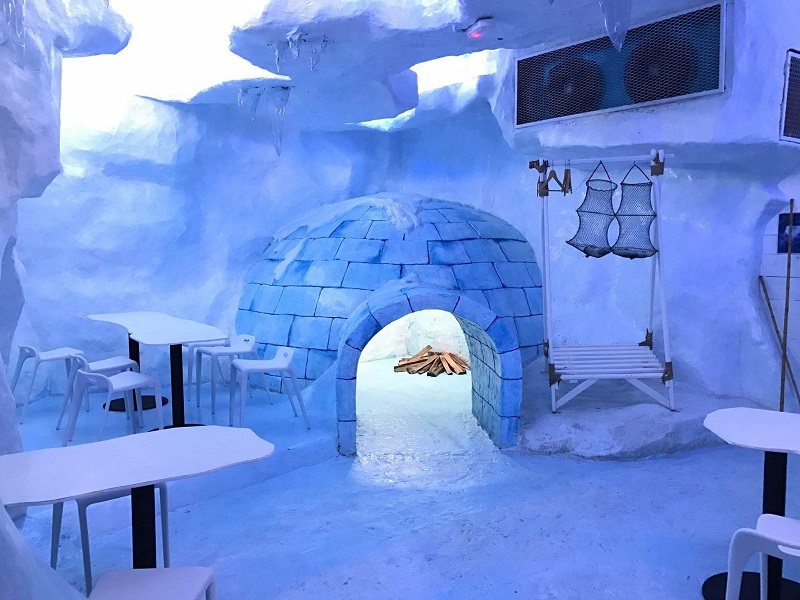 As you might expect, the café’s interior mimics the environment of the North Pole. However, customers need not worry about freezing to death as the temperature is suitable for the locals. In fact, many have dined here wearing t-shirts without any problems. Opening daily from 10.30 am to 10.30 pm, Ice Cafe has three interactive zones to maximise your experience. You can enter the replica igloo, lie on an ice bed, or access the “Frozen Interior, Ruin Castle” and “Cube Room” areas. Food items on the menu are also unique such as Kandar Ice Cream, French Fries Ice Cream, and many more. The price range for these items is from RM15 to RM36. One of the most annoying habits about dining out in this digital era is the use of mobile phones. Instead of communicating with each other and enjoying the food, everyone seems to be busy checking social media out or playing games on the phones. However, Dining in the Dark Kuala Lumpur eliminates any such issues. Here, you are required to leave your phones and watches in a special box before entering a dining area which is pitch dark! This way, you can give undivided attention to not only your food but also to the company you are with. Furthermore, it is said that without the ability to see, your sense of taste and smell will be elevated. This will make the food tastier and the entire dining experience better. Located in Changkat, Bukit Bintang, the restaurant offers a changing four-course meal. All your food will be served by the blind and visually-impaired too. For those of you looking for a local getaway to relax both the mind and body, be sure to visit The Banjaran Hotsprings Retreat, located in Ipoh, Perak. Endowed with the best of nature, they are a luxury natural hot springs wellness retreat offering bespoke holistic experiences. It is specifically designed for recouping peace and relaxation. Part of the retreat area is a mesmerizing wine bar and restaurant called Jeff’s Cellar. Set within a natural limestone cave, it provides a beautiful and romantic setting. Prepare for a whole new level of indulgence as you dine in an environment with ethereal lighting, intimate cave interiors, and breathtaking natural water features. On top of that, Muslim diners need not worry about the Halal status of the food. Despite being a wine bar, a spokesperson for Jeff’s Cellar has reassured everyone that their food does not contain any alcohol or pork, and all their suppliers are Halal Certified. 4. 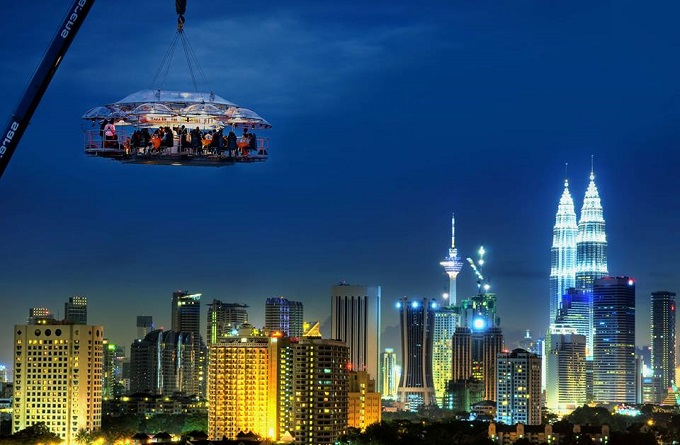 Dinner in The Sky — taking dining to new heights, literally! This next restaurant is probably the most popular of the five on this list, mostly due to the wide exposure it received on social media. Dinner in the Sky offers the unique experience of dining while being suspended 40 to 50 meters in the sky. The latest location for this treat is in Bukit Bintang, Kuala Lumpur. Not only will you get a nice view of the city, but you will get to indulge in a special three-course meal prepared by chefs from Sheraton Imperial Hotel Kuala Lumpur. All meats ordered from the caterer are strictly sourced and slaughtered in accordance with Islamic principles and their suppliers and producers are legally approved and certified by the Department of Islamic Development Malaysia (JAKIM). Diners will need to be over 13 years old, at least 145cm tall, and weigh no more than 150kg. Spots are limited, so you are advised to make early bookings. 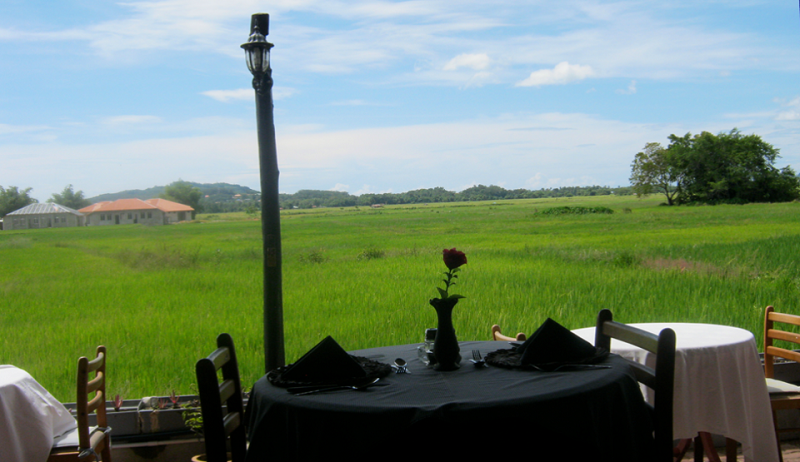 Malaysia is known for its beautiful kampung (village) environments and Pia’s The Paddy is a restaurant surrounded by the alluring views of a paddy field. Located on the popular tourist island of Langkawi, it is only a seven-minute drive from the airport. One of the restaurant’s most popular dishes is the beef rendang. In fact, users of website TripAdvisor say it has “such a delightful taste”. They rated the restaurant 4.5 out of 5 stars. Now, if you are planning a trip to Langkawi, be sure to read our blog post where you can spend a 3-days, 2-nights trip on the island for under RM400! All set to dig in? Eating out can be an expensive affair, depending on where you’re eating and how frequently you dine out. A dining credit card makes your meals tastier by offering deals and discounts on your food bill, and definitely deserves a slot in the wallets of the foodies! Check out some of the top dining credit cards in Malaysia right now! And here’s the icing on the cake. Apply now for a Standard Chartered or a Citi credit card on Bbazaar.my and get a Smart Health Bracelet worth RM250, plus RM50 Tesco e-Voucher! Hurry up, offer ends on July 31, 2018! Written by Ashraf Wahab on behalf of BBazaar Malaysia. BBazaar Malaysia (BBazaar.my) is a part of BankBazaar International, the world’s leading neutral online marketplace that helps people decide on financial products such as loans, insurance, credit cards, fixed deposits, saving accounts, mutual funds and many more. It is done over a highly secure, user-friendly, and intuitive platform. Founded in 2008, BankBazaar focuses on harnessing technology to deliver end-to-end paperless transactions which brings huge, hassle-free convenience to customers. The end result is a personalised offer down to the individual level. With a supportive customer service team and a growing community of users, BankBazaar is the easiest way for people to search and purchase the right financial products online. BankBazaar is supported by credible global investors including Walden International, Sequoia Capital, Fidelity Growth Partners, Mousse Partners, Amazon and Experian. In addition to offering financial products, BBazaar Malaysia (BBazaar.my) also provides accessible articles (https://blog.bbazaar.my) about everyday personal finance and lifestyle topics, simplified for everyone from beginners to experts. BBazaar Malaysia (BBazaar.my) believes that everyone should have a chance to learn about the financial world. 7 Adventure Activities in Malaysia Adrenaline Junkies Would Love!